RRB Group D Result 2018 update: Group D Result 2018 is likely to be declared in the second week of February 2019. According to reports, RRB Group D Result 2018 is expected to be announced between February 10 and 13, 2019. The RRB Group D Exam Result will be announced soon on the official website. Candidates, who had appeared for the Group D exam 2018, are advised to keep a check on the official website for any updates regarding the release of Group D Result 2018. 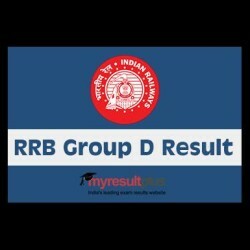 Guide to download RRB group D Result 2018 as follows. Step 1: To download the RRBGroup D Result 2018, simply go to the official website rrb.gov.in/ regional websites. Step 2: Click on the link for Downloading Group D Result 2018 option (link not yet active). Step 4: Download Group D Result 2018. Following are the regional websites to check the result. Note: The entire team of My Result Plus wishes All The Best to all the candidates for their RRB Group D result.